There are many reasons why people leave their jobs, some that involve life events in an employee’s world outside of work that are outside of the control of an employer (e.g. relocating with a spouse, staying at home with a young family, returning to education to re-train). 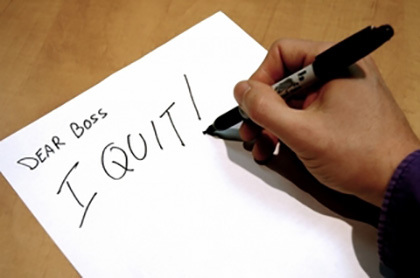 But the majority of reasons why employees quit their job are under the control of the employer, and it may not surprise many of you to learn the most cited reason to quit is down to an employee’s boss. Management’s recognition of employee job performance. They say ‘people don’t leave jobs, they leave managers’ and this still holds true today as bad bosses take pole position in a recent survey of why people leave. Most people have at least one bad boss horror story to tell and a recent survey by Glassdoor discovered that 2/3 of people will work for an annoying boss at some point in their career, and 1/5 will resign because of them. Employee’s don’t need to be friends with their boss, but they do need to have a relationship with them. A boss is too much of an integral part of an employee’s daily life for an uncomfortable relationship. To have a toxic relationship with the person you report to undermines your engagement, confidence, and commitment. Common complaints about bad bosses range from lack of recognition and feeling overworked, to disrespectful behaviour (anything from ignoring employees to taking credit for other’s work), negative attitudes, sexist comments and bad body odour! Sadly, recruitment has been ranked as the worst industry for terrible managers, followed closely by travel & tourism, marketing & PR, and accounting. On the plus side, people working within HR ranked their bosses as ‘most trustworthy’. Having a good relationship with the boss is often more important to employees than job satisfaction. Unfortunately for those who don’t have a good relationship with their line manager things are unlikely to improve anytime soon. 3 years ago the CIPD reported that the quality of managers had not improved over the last decade, and CIPD data published earlier this year suggested that senior managers lack the interpersonal skills needed to effectively manage staff, with more than 50% of people surveyed identifying people skills as ‘ineffective’. And so it seems that if you feel your current boss is a bad manager, or are thinking of leaving a role because of a bad boss, you are not as alone as you may have first thought.